Another day in post-op. A place to help, do medical work and build relationship. I like being in one place for a longer time. The day started at 7am, giving Jean a bottle. I love that little guy. Later I did Christelle's stump care - I had seen her yesterday, and the wound did not look the greatest, with a few pus pockets (excuse the grossness) and a few sutures embedded in the wound. I decided the sutures needed to come out (not sure why they were still there anyway) and today it looked great. Some of the external fixator pin care was painful today. Sad to have to hurt the kids, but if not done well, the pins become infected or attached to the skin, making it even worse for the kids. Two new patients came in today. 5 year old Michelanda with a fore foot fracture - a very wild girl. And sweet 13 year old Micheka witha tib/fin fracture with long leg cast. Unfortunately their caretakers were not too impressed with only a cot for the patient, and not for themselves. But there was little we could do. We are trying to do the best we can for the patients - food, water, shelter, good medical care, love. Is this not enough? Of course, it would be great if we can provide beds and amazing meals for the caretakers, but just not doable. 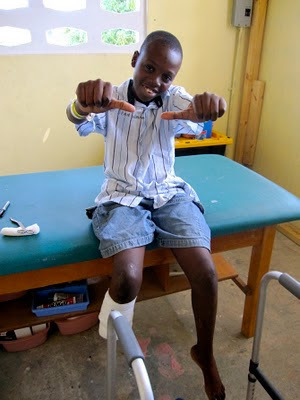 More stories were done today- one on Mistil - a 12 year old boy. 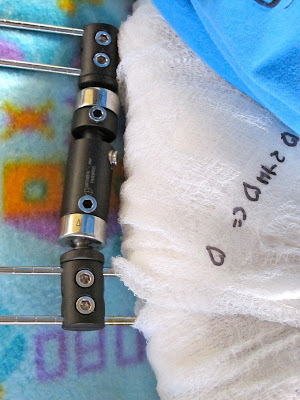 He was stuck inside for 5 days, under a wall and then ended up going to 6 different hospitals before his leg was amputated. Sad. I do wonder if his leg would have still needed to be amputated if he would have received good medical care before day 12. But, who knows, maybe his leg was so crushed it needed to be amputated anyway. Poor guy. I later heard he loves to play soccer. So I showed him pictures of the amputee football (soccer) team in Sierra Leone. That cheered him up a bit, but he still wants a new leg. Guess what he wants to be when he grows up??? An orthopedic surgeon. Touching. Literally made me cry right then and there. He is a kid full of smiles and so intent on keeping the other children happy. Yesterday he was asking for a prosthetic limb and it is so hard not knowing if he will or won't get one. He also often asks if his leg will grow back. Bless him. All I can say is unless God does a miracle and grows his leg for him, he will have to wait until we get him a new one. For more about him also see this article. In the evening we went out for dinner. Driving through lots of crazy traffic in the back of a flat bed. Rubble. Collapsed buildings. SOS 'we need help' signs. Tent cities. Lots of people. Remains impressive to see the state of the city. Wow...heartbreaking work. I am so glad that someone so compassionate like you is there to do this hard work.